UPDATE: Sky Mobile TV iPhone app now available over 3G | What Hi-Fi? Sky's Mobile TV app is now available over 3G on your iPhone. Previously only Wi-Fi-enabled, the service now gives you live TV over the 3G cellular network. 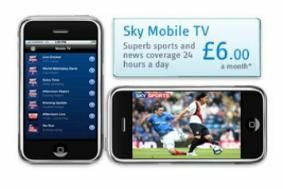 Yours for £6 per month, the Sky Mobile TV app is free from the iTunes Store and delivers Sky Sports channels 1, 2, 3 and Sky Sports News. Also on the service is ESPN, At The Races and Sky News. We've just given it a try and after a quick update to the app it seemed to be working swimmingly over 3G. To find out more about the service head over to the Sky Mobile website. Sky's Mobile TV service is now available on the iPhone and iPod Touch. The service allows you to watch all the Sports channels and more over a Wi-Fi connection. The service will cost £6 per month, though the first 150,000 O2 customers who sign-up for the service will get three months free – text Sky to 2020 for your promotional code. Sky Mobile will give you access to Sky Sports 1, 2 and 3, Sky Sports Xtra, Sky Sports News, ESPN, At The Races and Sky News.The app also allows you to browse the channel line-up to see what's coming up in the next 24 hours. You'll be able to watch live Premier League and Champions League football, International Rugby, Golf and more, though some content – HBO Boxing, NBA, MLB, Serie A and NCAA – will be blocked. All that's required is the free iPhone app from Apple's iTunes Store, a Sky ID and a subscription to the Sky Mobile service.